I've struggled for more than a week to write this review. I'm still struggling. Usually when I enjoy a game enough to want to review it the words flow from my fingertips, pointed and descriptive. Scythe is so good as to almost defy description. Let me explain. 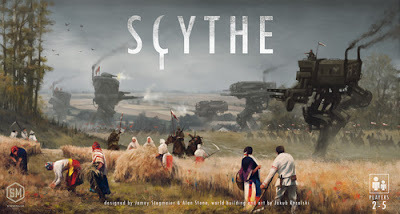 Scythe is a 4x game (kind of, more on that later) about gaining wealth in an alternate-universe, post-Great War Eastern Europe shattered by previous events. Players take on the role of faction leaders, competing to earn wealth, popularity, and a mandate to lead in this world. It's a hex-based area control and resource management game that makes use of restricted action selection and the threat of combat to maintain a constant pressure for you to be efficient, careful, and vigilant. That's an accurate description of Scythe that places it somewhere between Kemet, Memoir '44, and Agricola, games I like, love, and detest (respectfully), and yet the sum of its parts provide something unique in my experience. Scythe feels a little like puzzle-solving, provides a little of the quasi-negotiation you get from a good game of Kemet, and a lot of the pressure to keep up that you feel in Terra Mystica. See what I mean? In describing it, I've referenced four of the most popular games in our hobby without scratching the surface of what Scythe really is. That's the mark of something new - even in my most ambitious comparisons, I can only approximate its qualities. Read on, and I'll convince you to play it as quickly as you can. In Scythe, players endeavor to build wealth through a steady series of actions, each of which furthers their cause. Players construct mechs, build structures, travel across a board in search of random encounters and mysterious technology, recruit workers, and gather resources, ultimately culminating in a struggle for popularity (the scoring multiplier in the game) and coins. Actions happen in quick succession and with little downtime, compared to the norms for a game of this depth, one of the many striking differences between Scythe and other area control games. The available actions are interconnected in such a way that you have to do each at some point in order to do the others - you've got to gather resources so you can spend them, but you've got to consolidate enough power to defend yourself, while keeping up with the rate of expansion by your neighbors and maintaining popularity. It's maddening in the best possible way. I've played Scythe twice, and both times I've felt intense pressure to tighten my play, to be more efficient and more forward-thinking, almost as though I was back in school with an overbearing teacher looming over my shoulder judging my progress. Somehow that isn't a bad thing, because the mechanics are just so damned interesting, almost to the point of distraction. Unlike Agricola and Caverna, similar games where this kind of pressure removes me from flow, Scythe is captivating enough that I really feel like the leader of a downtrodden people, tasked with performing the improbable under desperate circumstances, with only a map, a cup of coffee, and a resolve not to fail my countrymen. Workers and mechs are never destroyed, only returned to your starting space. Because of this, you can only be temporarily inconvenienced, and never eliminated. Perhaps this makes "4x" the wrong tag - it's more like 2.5x (because encounters are only exploring in name, not function). You're never punished for making "poor choices", only rewarded for making good ones. There's no mechanism that sets you back, no random penalties, and nothing to prevent you from doing whatever you want to do with your faction. You have complete freedom, limited only by the fact that somebody will eventually end the game. Combat is important, but the threat of combat is constant. Combat resolution is similar to Dune/Rex, in that combat power is a finite resource that ebbs and flows for each player. This means that even the toughest, nastiest player will eventually succumb to a smaller force. Just like every other aspect of Scythe, you can get ahead by being a bit of a bully, but you can't win that way (at least, not easily). The player who comes in behind your path of destruction with a well-designed plan for gaining popularity and using the land will prosper. Each turn matters, but winning isn't a question of efficiency - it's a question of balance. For example, it's common to feel a runaway leader problem when a player has a large presence on the board. In any game where dudes are on a map, more dudes feels like more power, more points, more winning. Not so in Scythe. Territory control is an important part of promoting your faction, but often your conquests can outstrip your ability to produce and maintain, leaving plenty of room for opponents to take other paths to victory. It's hard to describe, but it's absolutely true. 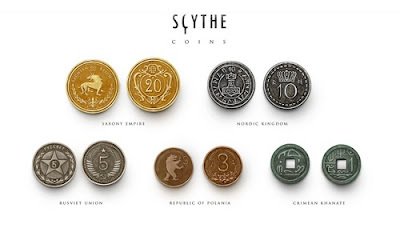 These coins are like the 10th best thing about Scythe. Now that's value. Scythe is intense, thanks to the kind of design that only happens with nearly 1,000 playtests. Scythe is beautiful, thanks to art by Jakub Rozalski. Scythe is breathtaking at times, familiar at others, and ultimately as immersive a gaming experience as I've ever enjoyed, in lofty company with Twilight Imperium and Advanced Civilization. I have so much more to say about this game, but I just can't pull the thoughts together well enough to get them on paper. I'm hooked. I'll play the review copy at least 10 times before the game is delivered. Scythe will be an important part of my game collection for the rest of my life. Decide for yourself whether to back the game or not (I am, obviously), and I'll leave you with a final aside: during the first game of Scythe with my wife and three dear friends, there was a moment about halfway through the game where the table collectively paused, drew a breath, and exhaled slowly, almost like we'd just come out of the water after a deep dive. The feeling of "flow" was palpable, and as I looked around and saw the concentration and enjoyment on their faces, I couldn't remember another time that I'd ever experienced that during a board game. Interview: Jamey and I chat about Scythe on Back It!